Nature's beauty reflected in an elegant Peacock feather design. 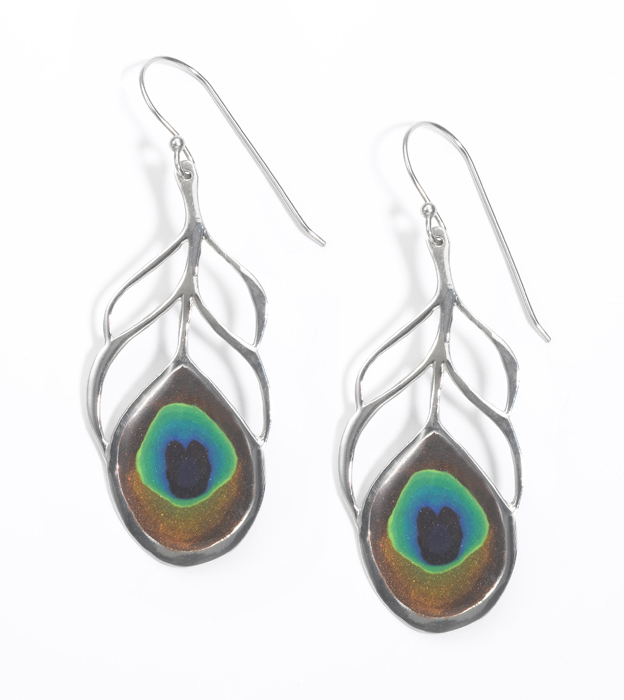 These (3.3 cm, 1.3 in) sterling silver earrings brilliantly mimic the stunning colors and combinations of the peacock feather. Let their beauty enhance the beauty of the wearer. The peacock symbolizes self assurance, and the 'eyes' at the tip of the feather symbolize the ability to see the past, present and future. With so many eyes, the peacock can see everything! When its beauty is revealed, we cannot help but give it our attention, and so are reminded of the beauty of everything in life. The ancient technique of Millefiori using polymer clay has been used by the artists of Adina Plastelina to mimic the eyes of the peacock's feathers with all the brilliantly contrasting colors. Then they set them into unique, feather shaped earrings, with two spines on each side. The earrings (4.3 cm, 1.7 in) are made of 925 sterling silver. When you wear these earrings, no one will be able to ignore you!